I am so excited to be able to share a post on NurtureStore. It has been one of my favourites for years and Cathy is one of my favourite bloggers! I would love to see you over on Creative Playhouse. This is a really simple and fun activity that any age can enjoy! 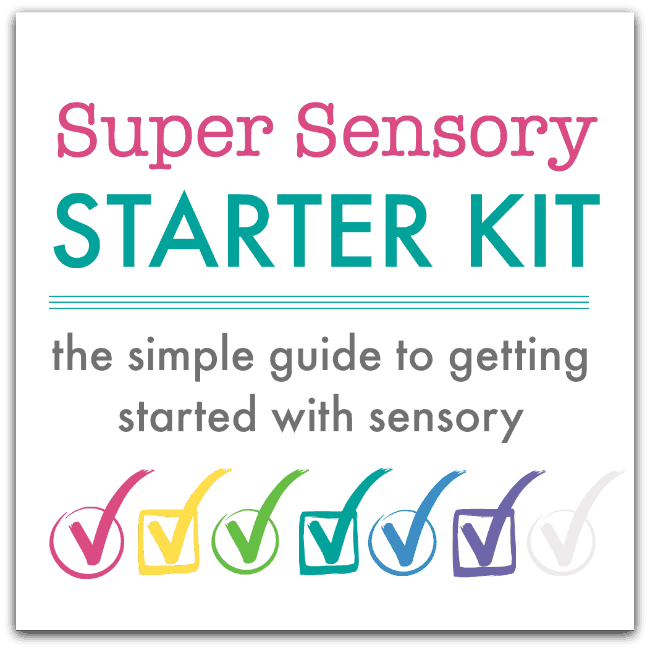 And it can be adapted in many ways, depending on what you have available, what your child enjoys and how old they are. 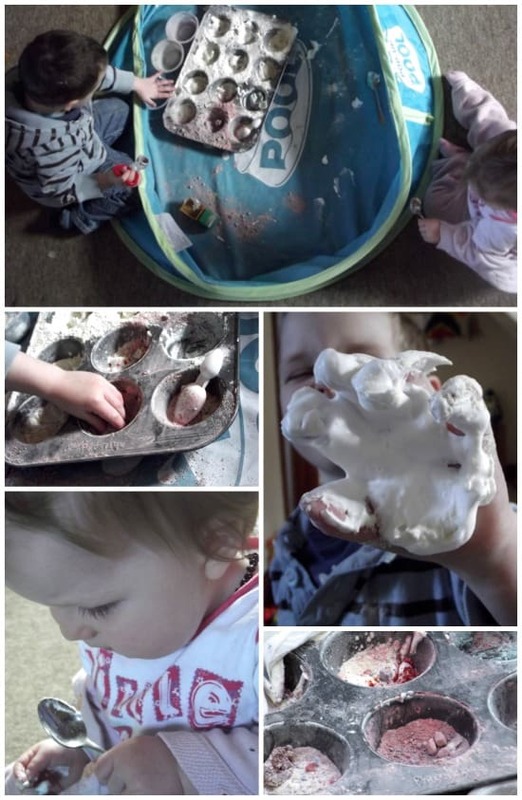 I set this activity up for my 3 year old and then 13 month old to provide a play experience they could enjoy together, so I kept it very simple. 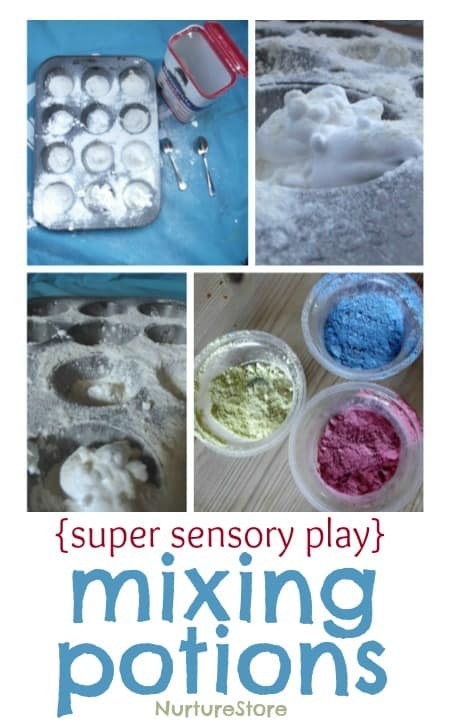 They both really enjoy sensory play; Jake (3) particularly likes scooping, pouring and mixing, and Poppy loves anything wet and messy. 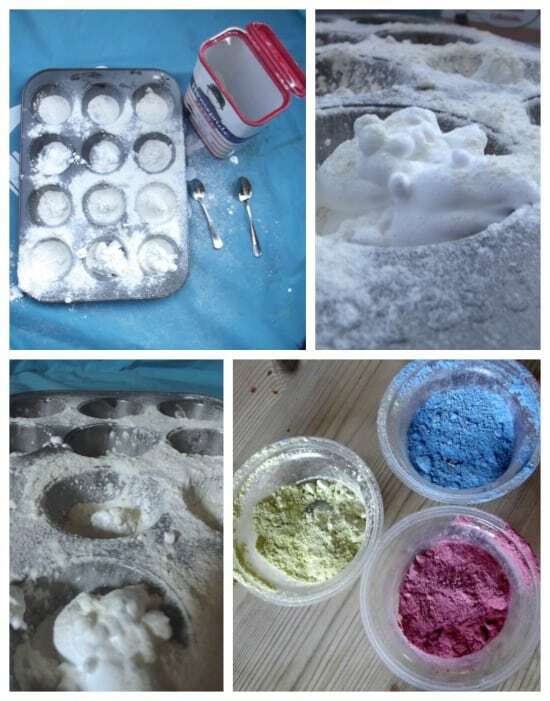 So, I put together a muffin tin, some spoons and pots, some shaving foam, some plain flour and some crushed coloured chalk. I put it all inside a pop up paddling pool to help contain the mess and let them at it. The foam and the flour did look really inviting, and Jake was quick to start mixing it all up. He soon began adding the different colours, mixing the colours and telling me how he was making new colours and magic potions, then medicines, cakes and super petrol! Poppy was busy watching Jake, playing with a teaspoon… she occasionally dipped it into the foam or chalk and wiped it on her fingers or cheeks, she tasted it a couple of times too. 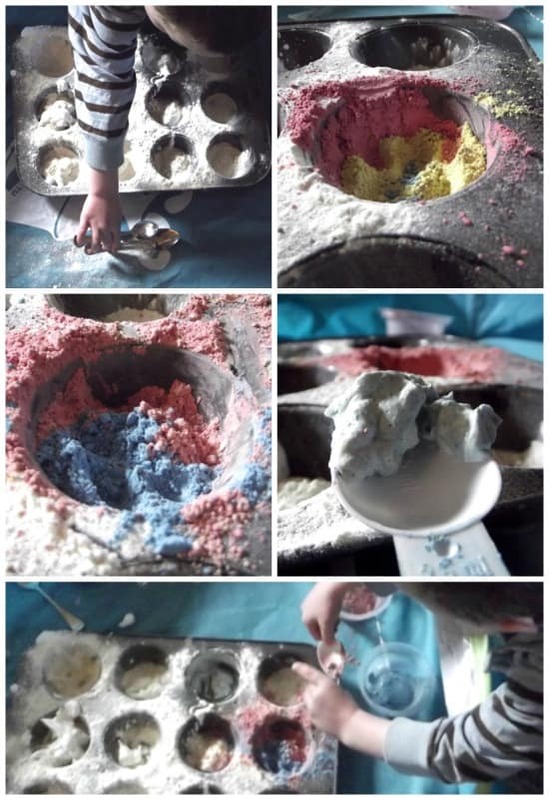 Jake also found some more tools from his playdough box and scooped his mixture into the pots and into one of his trucks for easy transportation. His imaginary play with the simple sensory mixture was lovely to watch. It was also so great to watch both children play alongside each other; they often can’t or don’t want to play with the same things, or if Jake builds something Poppy will knock it down, but with this type of open ended sensory play they happily shared the space and materials and were able to play in their own ways. They both had a lot of fun, and as I often witness with sensory play, they were both calm and in good moods afterwards. When they had finished I just popped the paddling pool outside until they were napping so I could tidy it up properly. So simple. Katherine has a background in special education, early years childcare, and has a BA and MA in the creative and performing arts. 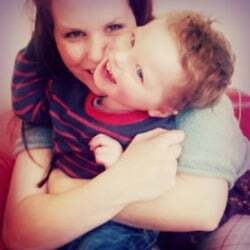 She blogs at Creative Playhouseabout her children’s activities and interests, including offering an Ecourse on Connecting Family through Creative Play, she also runs parent communities, is a designer and a work at home mum to Jake (3.5) and Poppy (15 months). This was a great idea. I added vinegar, baking soda & watr to the mix to interest my 8 yr old as well. Then we froze some of their mixes to see what would happen. I used an old sheet on the floor since I didn’t have a pool. A nice way to get my 8 & 3 yr olds to play nicely together! Thanks! I’m so happy to hear you had fun with this Nicole. Great idea to try freezing the potions!